I did not know that dirt bikes were OK to ride on the ATV trails in Maine…oh well…I am always learning something new! Although if you do ant to ride your dirt bike, please check with local clubs as some land owners do not permit them even though the ATV trails are OK. Plum Creek land is one example. 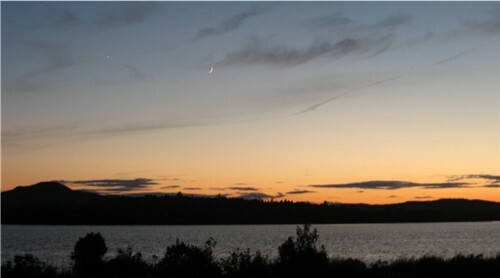 Last night, I heard the call of the loon so I went out on the deck to listen and wait for the next concert. It was about 9:30. I do not know what the temperature was but it was warm and comfortable. The air was still and quiet. The sky was dark but more of a royal blue color, but dark enough that I could see the stars. The sunset was still showing a touch of orangey glow just over the edge of the mountains giving the skies a touch of light. What really caught my eye though this night was the moon. I guess it would be a quarter moon as only a thick sliver of it was shining bright. SO bright, it cast a glow on to the lake right over Hog Island and ended subtlety on our shoreline. ..like it was leading someone to us….LOL. The lake was calm but still quivered a bit so the moons reflection was even more intense. As I sat waiting to hear the call of the loons, I did not mind watching the moon and even saw a few lighting bugs flickering down by the shore and a shooting starÃƒÂ¢Ã¢â€šÂ¬Ã‚Â¦I think that is what it wasÃƒÂ¢Ã¢â€šÂ¬Ã‚Â¦.but never heard the loons again that night. StillÃƒÂ¢Ã¢â€šÂ¬Ã‚Â¦what a perfect night it was. One of our guests was able to capture the sky on film and just sent it to me today (July 24th). If this was taken on the same night, it was at least a half hour before I went out as the sky is just a bit brighter and the moon a little higher but…hopefully, you can imagine the beauty a little better now that you can see the picture. We have had so many more guests this year here to ride the trails 😀 It seems that finally, people are finding out about them and coming up to enjoy. Trails to the south are very bumpy and not as much fun unless you like going over rocks. The newer trail to the border “”IS GREAT ❗ “” There are a couple areas you have to cross over some water holes but if you don-t stop in the middle of them, there is no problem. One guest went out by himself one day (wife was pregnant) and saw a big cow moose on the trail. He stopped. Then she started walking toward him. He started to back up down the trail. Then she stopped, so he stopped. Then she started to walk toward him again. He decided to keep backing down the trail, turn around and come home. He figured for her to do that, she must have had her babies near by and he didn-t want to aggravate her. Trails Northeast of Jackman (toward Rockwood) are also excellent. At the beginning of the season, some riders complained that the trails were to dusty (all 20 of them who road together) but all have said that the views from the summits are incredible. We have been waiting for Rockwood and Pitston Farms to complete the trails from their end to connect but as of yet, you cannot get to those areas. This will be my final entry for Tuckaway Shores Cabins since it has been almost a year now that it has been closed and the signs were taken down by the new owners. It is time to let it all go. Since I first posted an entry about the property in June, much has happened. All but 2 cabins have been removed, all of the debris has been cleaned up, the land has been cleared, much of the insides of the house have been salvaged for use elsewhere, and half of the house had fallen. Yesterday, the rest of the house came down. When you see the pictures below, you will see the last of Tuckaway Shores, the last of this storyÃƒÂ¢Ã¢â€šÂ¬Ã‚Â¦and the last of it all happened in about 12 hours. Below are the shots of the house, the clean up and now all that is left is the foundation. I am sure the new owners appreciate the history behind these log camps and home, but I also know they are also more excited and ready to make this their home. Geocaching has become a favorite pass time for families, hikers, ATV riders…almost anyone who enjoy the outdoors and love a little adventure, and have a GPS device. This is a world wide adventure game that has hit the internet. You can go to this site www.geocaching.com and put in a zip code of an area you want to visit and it will give you the GPS location of any number of caches available in that area. You may find a treasure, (this could be a CD, a map, jewelry, software, tools and on and on) or maybe just learn something new as a standard in a cache is the log book which you can read and see who else found this spot. Remember though, if you take something, its only fair for you to leave something in return. GEO- is for geography and CACHE is a term which can be used in hiking/camping as a “”hiding place for concealing and preserving provisions””. Last week, we decided to try to have a potluck picnic with our guests. We planned it for July 1st …a kind of pre-4th of July picnic. We sent out invitations to those guests registered and everyone participated. What a variety of foods too…hot dogs, chicken tenders, meatballs, cole slaw, baked beans, pasta salad, “”stuffies”” from Rhode Island, grilled veggies, an amazing garlic dip and beer bread, plus about 4 or 5 pies and of course, the all time campfire favorite, smores! It was pretty chilly last evening but everyone put on the coats and sat by the campfire. Even after the sun went down, those who could lasted, enjoyed a few fireworks.